A full over full bunk bed features two full size beds (each can accommodate a mattress the size of 54 x 75 inches) stacked one on top of another. 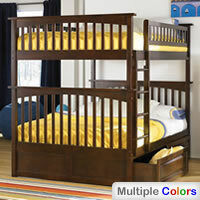 Such a configuration is suitable wherever lots of sleeping space is needed, particularly if living quarters are tight. 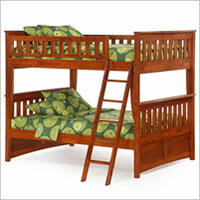 Families with multiple children, for example, will certainly appreciate it, as each bed can easily accommodate two smaller kids. 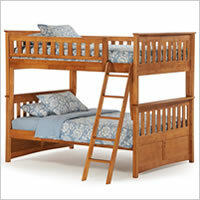 It is also a fashionable and practical solution for guest rooms; a full over full bunk bed, especially if equipped with a trundle bed, can comfortably house an entire mid-sized family. 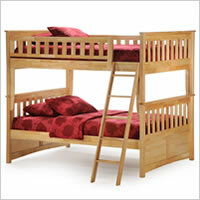 Of course, such a bed will do great in more common situations too; you will find no better sleeping solution for a couple of teenaged or college kids who have to share a room, as they will certainly appreciate the extra sleeping space. 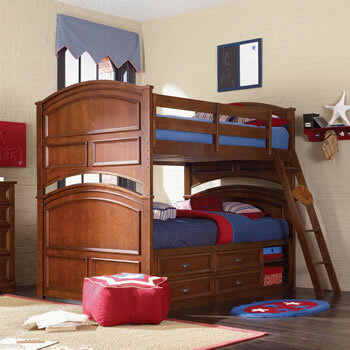 Come to think of it, the extra space will probably be appreciated regardless of how small or big your children are -- and as a bonus you won't have to worry about them outgrowing their beds. 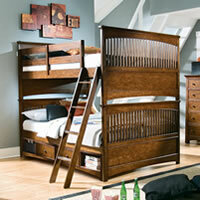 Featured here is Lea's Deer Run Full Bunk Bed, a fine representative of its class. For more shapes, styles and colors, browse the selection below.